Home page > Events > Library & Book Events > Rencontres littéraires at the Institut! Rencontres littéraires at the Institut! 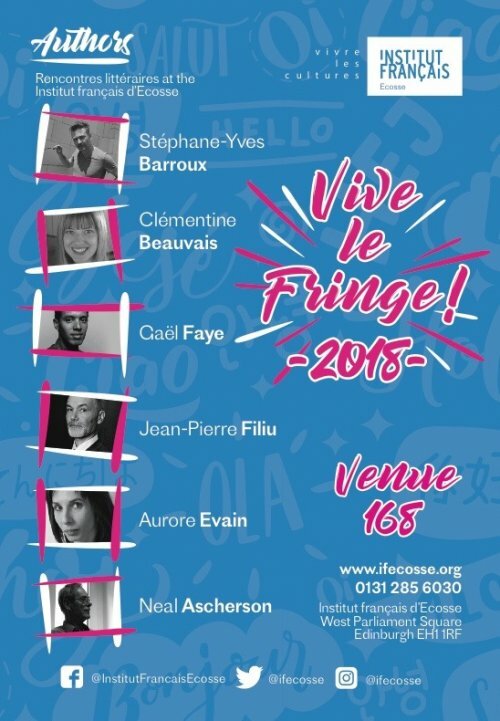 The Institut Français will organise a series of informal literary discussions with several authors invited by the Edinburgh International Book Festival (Stéphane-Yves Barroux, Gaël Faye, Jean-Pierre Filiu and Clémentine Beauvais), as well as Aurore Evain and Neal Ascherson. We will discuss themes as diverse as the Franco-Scottish relations in WWII, the place of women in early theatre creation, and illustrators’ work! Neal Ascherson, renowed journalist and Professor has spent much of his life studying World War II. His latest book, The Death of the Fronsac focuses on life in wartime and on Poland’s fate. The rencontre littéraire will focus on the theme of the franco-scottish relations during the war. Organized in collaboration with the University of Edinburgh, this conference entitled "The Matrimoine", by artist and scholar Aurore Evain will question the position of the first female actresses and playwrights to consider the everlasting presence of women in creation. Clémentine Beauvais is a French children’s author living in the UK. Her Piglettes won France’s biggest children’s book prize, the Prix Sorcières. She will talk about her new teenager book, Brexit Romance, staging with humour and emotion love and friendship relationships in the new Brexit context. French-Rwandan Gaël Faye is not only a writer, but also a composer and rap artist in the pure hip hop tradition who received the prestigious Victoires de la Musique Award in 2018. This informal event in the Institut’s médiathèque will look at Faye’s career as a multidisciplinary artist and his award-winning debut novel, Small Country. Distinguished historian, professor of Middle East Studies, former advisor to the French Prime Minister, Jean-Pierre Filiu has recently published a graphic novel exploring the history of relations between America and the Middle East. He will talk about his career as a diplomat and a professor. Stéphane-Yves Barroux worked as an art director before working in chidren’s illustration and press cartoon. The rencontre littéraire in which he will take part will be about the work of an illustrator.